Airtel has launched Internet Wi-Fi broadband plan in 3 categories and the categories are fast, faster and fastest based on speed of data transfer. 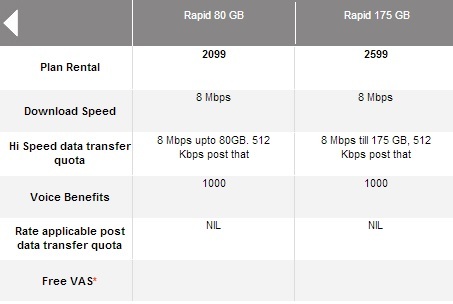 You can compare the plans on basis of Rental from Range 699 INR up to 5299 INR and speed, Data Transfer Quota, Post Speed after finishing the Data Transfer Quota . 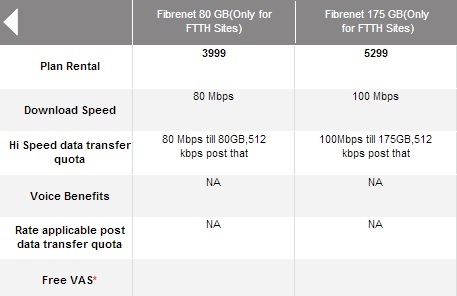 You may decide your plan as per your needs.You have to analyze the plan as per your internet necessity.If you are buying Wi-Fi Modem then you may connect 3 systems at the same time.If you are looking for Unlimited Internet then Max Super 9 GB plan (999 Rs. Rental) is a best plan within range 1000 INR in the category fast and You won’t face any problem in surfing the internet. If you are looking to more speed of Internet to watch movies online, YouTube videos, Training videos then Rapid 15 GB (1299 Rs. Rental) is one of the best plan in the category of Faster. This entry was posted in Internet on March 26, 2013 by Yogesh Bajpai.